Blue Satin Sashes: If I was a princess.. This is the Manhattan apartment of 22-year-old supermodel Jessica Stam. 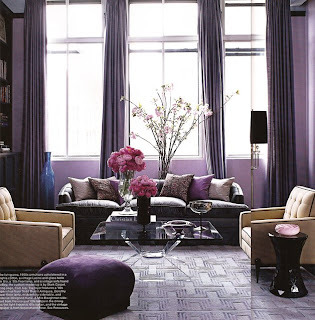 Stam's humble abode was featured in the October issue of Elle Decor. I love purple. Lovelovelovelovelove. A few homes ago I had a purple bedroom: lavender walls with a rich, dark eggplant duvet and lavender sheets, with dark wood furniture. My husband is not such a fan of purple, so we've compromised on light blue and brown for our bedroom -- masculine enough for him, feminine enough for me.